Do you know your own VO2max value? This value is an important parameter when classifying your endurance performance. In the running.COACH training plan, you can calculate your VO2max on the basis of previous finishing times. This will help you to track your performance over a longer period of time. In this blog entry you will learn what VO2max stands for, how it can be calculated and what is needed to improve your personal VO2max rate. The VO2max rate is the maximum rate of oxygen uptake measured in a human during incremental exercise. It’s about the oxygen taken up, transported to the cells and, ultimately, utilised. Further, it is specified in mL/min/kg and shows how many millilitres of oxygen your body can take up per minute per kg body weight at maximum exercise strain to metabolise it in the cells. Hence, the value shows the endurance performance of an athlete. Generally speaking: The higher the VO2max value, the better the athlete’s endurance performance. What lies behind this formula? V is the volume, O2 is the chemical notation for oxygen and max stands for maximum. It becomes clear: We are calculating the maximal volume of oxygen. As it is about a measure mainly concerning volume and time, it could be expressed in litres (of oxygen) per minute. However, to couple it with physical activity, it’s necessary to include the variable of weight. It is for this reason that VO2max is normally expressed in millilitres of oxygen an athlete can metabolise per kilogram and minute. How can I profit from knowing my VO2max value? Knowing your VO2max value, it’s possible to rank your endurance performance and deduce your overall state of fitness. 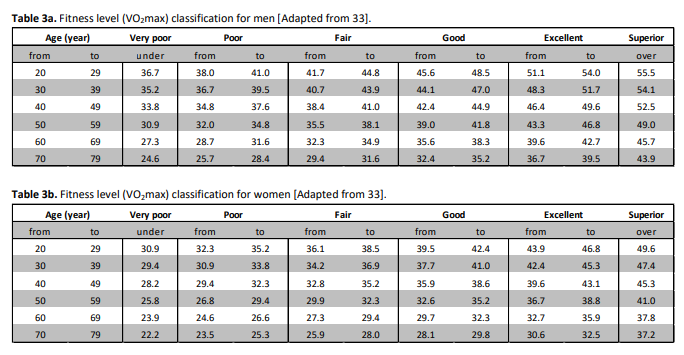 The table below shows an overview over fitness states according to the VO2max value. The value also depends on age and gender. The value shows every athlete their limits and makes training planning easier. It can thus be used to plan future competitions in an optimal manner. The most precise method is to determine the value with a spiroergometric test (breath gas analysis). The test is incremental, which means that the resistance is raised gradually until maximal strain is reached. This can be done on the treadmill or on an ergo bike. With a mask over nose and mouth during the test, the consumption of oxygen is measured, which is how the maximum value is determined. The more intense the activity, the more oxygen the body needs. Measuring the VO2max permits an athlete to know their limits. There are also other methods that are indirect (and a bit less accurate) to get indicative results. Rockport test (or Mile test): A complicated formula that is often referred to on the internet, but it’s not very accurate. Various GPS-enabled sport watches display a VO2max value for every workout. The watch manufacturers use algorithms from firstbeat.com require personal data (gender, age, weight, training experience) and effective data from your workouts (velocity in relation to heart rate). Often, these calculations are quite accurate. However, this method is less reliable in hilly terrain, challenging ground (e.g. trails) and in trainings with interruptions. Competition results: With the running.COACH training plan and the statistical evaluations we can analyse your competition results. Of course, these calculations are still an approach to lab results. Still, a very accurate one, as has been shown. To date, inaccuracies exist when it comes to technical trails, ultramarathons and measurement errors of the watch (e.g. measurement inaccuracies). By the way, the calculations and statistical evaluations are also part of the freemium version on running.COACH and freely available there. 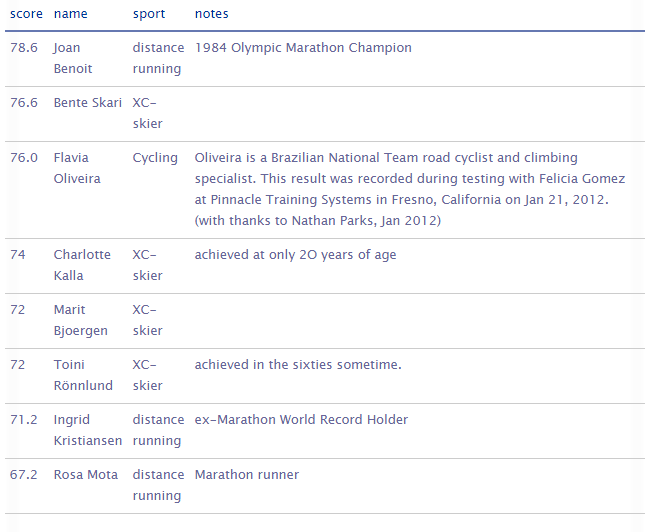 The data are used for the planning of individual trainings in the running.COACH training program. Log in to your account on running.COACH (if you don’t have an account yet, register here for free). Enter various previous competition results of yours. This can also be done by exporting the stopped GPX file from the platform of your watch and manually importing it to running.COACH à change the type of training to competition and name your entry (e.g. Berlin Marathon). 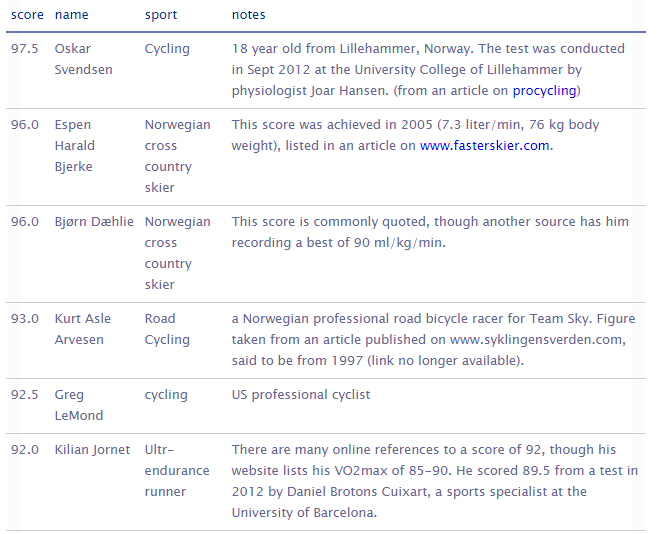 Go to Statistics and scroll down to the competitions. Next to the ANS (anaerobic threshold, green line), there is a column for the VO2max value (yellow line). Besides, these two values correlate. The graph also shows the development of your form over months and years. The VO2max value is a useful measure for the aerobic energy metabolism. Even though the value does not account for a good endurance performance, it lies at the base of it. Crucial factors are also the technique, the discipline and the mental component. 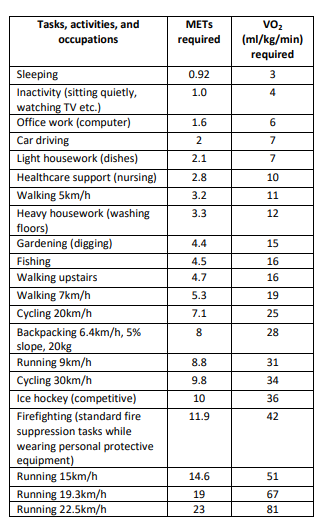 The table below shows which activities in everyday life or which workouts need how much oxygen. The more intensive the activity, the higher the VO2max value. In order to achieve a certain pace when running over a longer period of time, a certain VO2 value is required. In order to run a marathon at world record pace, a VO2max of around 84 mL/kg/min is required. Which marathon finish time would you be able to achieve based on your personal VO2max value? Further, it is possible to observe your VO2max value over a longer period of time. Thus, you can analyse your own performance curve and see if the training suits your goals. 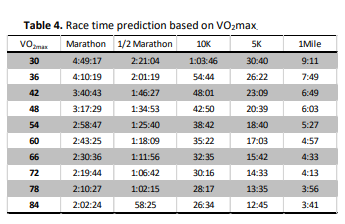 On the basis of the VO2max value you can make a prediction for your next competition for a particular distance. In the following table, though, altitude profiles are excluded. If you are interested in a prognosis for a particular run taking into account altitude, gradient and meters above sea level, please consult our running calculator. If the competition you are interested in is not in our database yet, don’t hesitate to let us know (support@runningcoach.me). Higher VO2max value = faster? A higher VO2max value does not in itself mean that your performance is better than the performance of a person with a lower VO2max value. Significant factors in this equation are also the technique, the type of sport and the mental constitution. Also competitive athletes, the VO2max value is an important parameter. In the following, we present you an overview (information supplied without liability, based on internet research) over the highest VO2max values among competitive athletes. Cross-country skiers generally tend to have higher VO2max values as they use their whole body for this type of sport. How can I improve my VO2max value? The less trained a body is, the easier it is to improve its VO2max value. For very well trained runners, it gets harder to make big steps of improvement in this domain. At some point, genetic and physiological factors inhibit pushing the limits further and further. 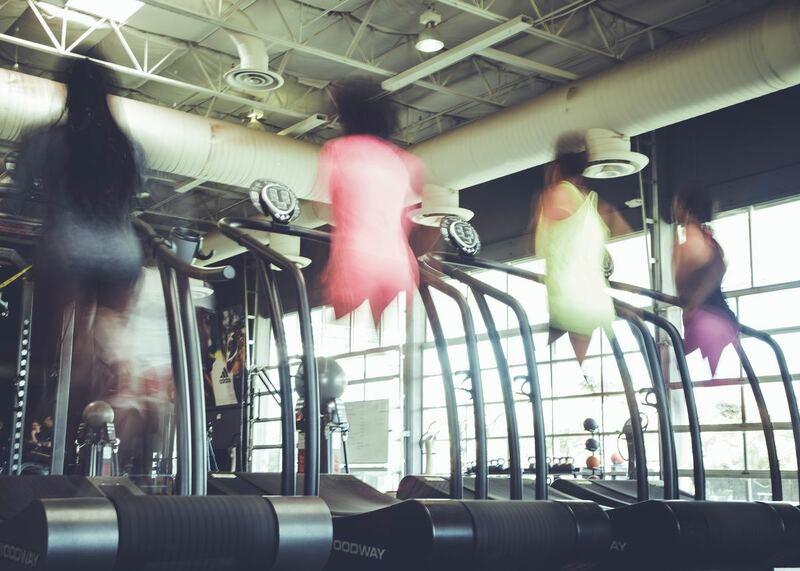 To make progress nonetheless, we recommend you run in a structured and differentiated way. A good mixture incorporated in your training will bring progress and challenge your body on various levels. Longer and shorter units, rapid long jogs and intensive workouts should alternate. For the increase of the VO2max value, there are a few typical intensive trainings. For example, you can do hill sprints (5x4min) or intermittent workouts of 15 seconds fast, 15 seconds easy over 10 minutes. 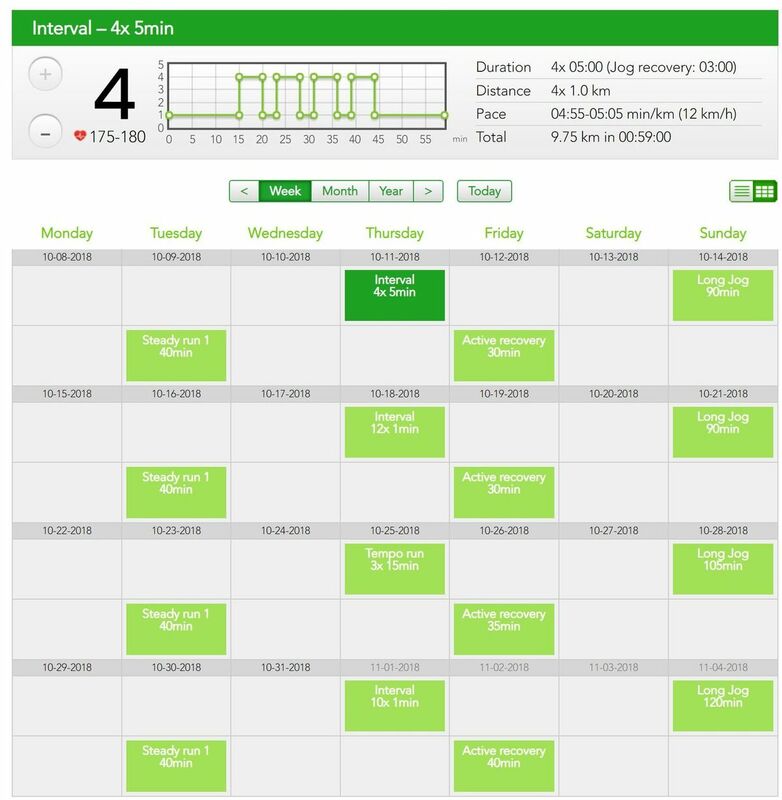 Our running.COACH training plan provides you with structured everyday trainings and shows the optimal intensity for you. Check your individual and dynamic plan for free here!